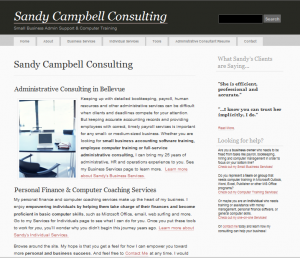 When Sandy Campbell came to us, she was unsure of exactly what she wanted her website to become. A seasoned office manager and bookkeeper, she was hoping to enter a new phase of life by going out on her own. But which areas of expertise should she highlight? And how could she communicate her skill set succinctly? We started elbow-deep in her filing cabinet and ended up with a potent website that packs a powerful punch! Perhaps we are most proud of the way we managed to capture Sandy’s unique combination of professional edge and heartfelt sincerity. We knew we’d succeeded when she called us one day to tell us she already had more clients than she had time to help!